Who doesn't remember where they were on that Tuesday morning in 2001? Collin and I talked about it this morning before he left for work. He was working at Grone's Cafeteria in Webster Groves. He'd just left for work. 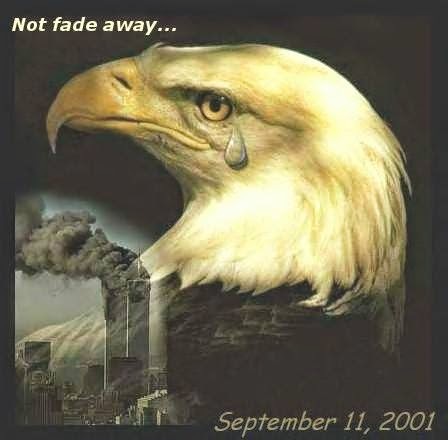 I was getting ready to go to the library, watching the Today show, when Katie Couric and Matt Lauer stopped what they were doing on the air to bring a news bulletin: a plane had hit the north Tower of the World Trade Center. It took me back to a night in November 1985. I was in New York for my first meeting with my editor and publisher at Berkley. They'd just bought my first novel that spring. My agent, her assistant and I had dinner at Windows on the World. I was disappointed because I'd wanted to go there for the view, but that night, the fig was so thick, it looked like a pea-green screen had enclosed the building. "We hold our breath when this happens," our waiter commented. "We've had a few near-misses with small aircraft." Being a writer, the ideas were already churning around in my head...including a scenario that had appeared on the short-lived X-Files spinoff, The Lone Gunmen. 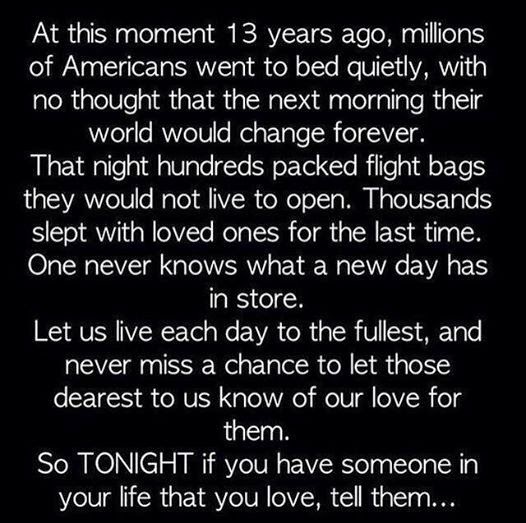 I remember where I was when I heard the news that the Pentagon had been hit...when a group of brave passengers about United Airlines flight 93 had overtaken their hijackers and prevented even more loss of life by bringing their plane down in a field in Shanksville, Pennsylvania.... 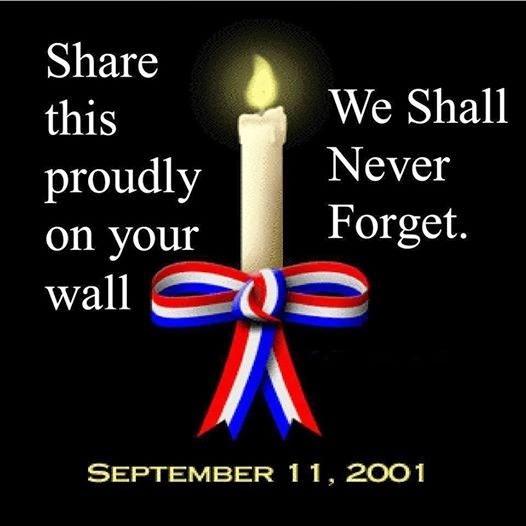 I remember watching the towers fall on a small battery-powered TV in the checkout line at the grocery store. Thirteen years later, Osama bin Laden is dead...but the war on terrorism continues. What will it take to bring these monsters down? How many lives will be lost? My dad used to say a war would never be fought on US soil. I wonder what he would have said that morning? The bombing of Pearl Harbor, the assassination of President Kennedy, 9/11... Events so terrible we can hardly comprehend them. But we endure. No, we won't forget. Great post. I do recall the episode of that series pre-dating 9/11. And Tom Clancy pretty much predicted it with the ending of one of his novels having a passenger jet crash into the capitol building. On that day, he ended up being interviewed by one of the networks. My x was home watching the news, drinking coffee and reading the newspaper as I left to drive the kids to school. When I came back home on the news the first tower had been hit. Does anyone remember when the first attack on the Twin Towers took place when Clinton was in office. They had set bombs off in the car park under the Towers. Clinton just waved it off. That should have been the first sign the Towers were a target. I was working for Anderson and Tucker at the time. That morning I was on the line with MetLife in NYC, when the woman on the other line screamed and hung up. Two seconds later, the boss's daughter came out screaming we were under attack. I was online with a friend working at the space center in Florida when the shuttle Columbia went down. We were having an email conversation, and she disappeared for a few minutes. Then she came back on and said, "We've lost Columbia--it's off the radar!" I was driving the NIU bus. Someone on the bus said out loud that the twin towers had been toppled... etc. and couldn't get over it. I remember getting home later on and seeing the whole ugly thing on TV. Since I live in Illinois, the quiet aftermath was more chilling. No airplanes flew and the sky was the bluest I've ever seen. My husband and I went away for a few weeks. It was how we handled it. Then. Every year, when we drive on that day we're told to be aware of "suspicious" packages etc. Really? I'm so busy driving I don't have time to check for that. It worries me that others are not "aware" of their surroundings enough any more. We have that here as well. There are signs at all the bus and light rail stations, asking passengers to alert operators or security if we see abandoned packages, backpacks, etc. I turned on the TV just as the first plane hit the Tower. I called my daughter and told her to get to the base. She made it before her Director and I stayed glued to the TV set. For some reason, Americans do not realize how many people out there want us destroyed. A while back, Lin Robinson told me the Muslims hate us because we defend Israel. I think they'd hate us even if we didn't. I remember that day very well, along with the acute awareness that I am permanently changed. Truly, I did not comprehend hate until that day. I think we've all been irrevocably changed by that day, Lynn. It was evening here Norma.. I was reading with the sound on the TV on mute while waiting a program to start, I looked up to see the planes and thought I had the wrong channel, switched over and the same thing was on all channels.. I just sat there totally shocked, it was almost incomprehensible ! I hope we never see anything lime that ever again. Sadly, Grace, I think we will.